Today was Chloe’s first ‘one pair of underwear’ day. I certainly know we’re not done having accidents and we still have a long road ahead of us, but I feel like we accomplished something at least. 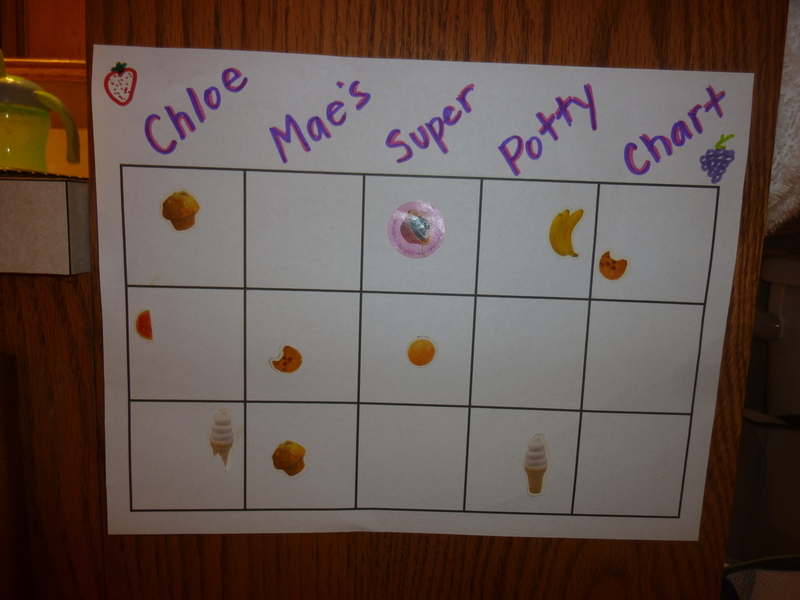 We have several completed sticker potty charts and are working on a third. Chloe Mae likes getting her stickers, and is getting the idea that she has to fill up all the squares to get a ‘big girl prize’ as she calls it. We even worked on her counting skills tonight – she needs 5 more stickers. But the biggest motivation for my strange, adorable, little girl – she gets to wash her hands after she goes potty. Gotta love her!! Indeed, we did. Although we’re exhausted. I’m going to blame part of this of the fact that while we spent the weekend potty training Chloe, she was dealing with a summer cold. She was okay during the day, but had a rough time sleeping. That means we had exhausting days and sleepless nights. But… our days of potty training were fairly successful. So that’s a plus!! 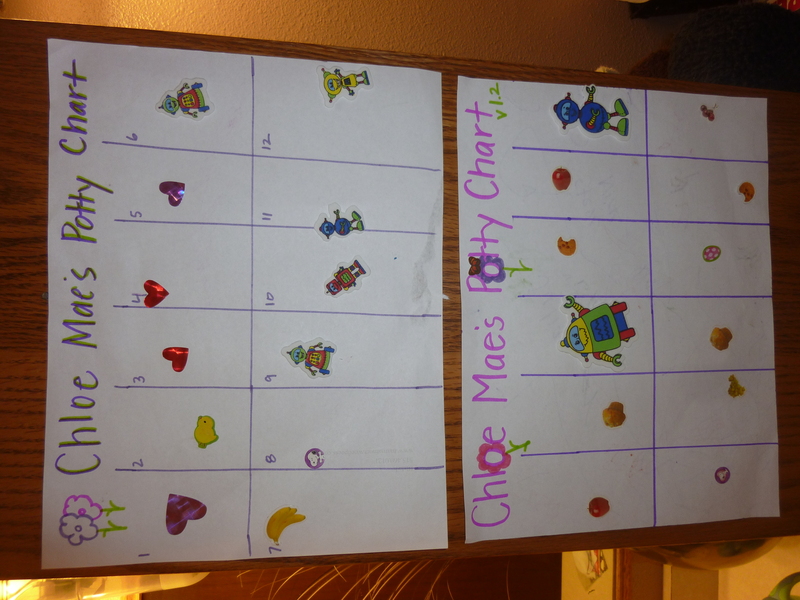 Saturday, Chloe made it to the potty about 15 times, including both times she needed to go #2. We were accident free through the morning, but had 3 accidents in the afternoon. However, all 3 time she stopped herself and ran to the potty to finish her business. I was pretty darn impressed!! This morning, Chloe filled up her sticker chart and got to pick out her first prize. From all her options, she chose play-doh. Playing with her first prize. Ironically, while she was playing with her play-doh, she had an accident. Overall though, she had another good day with at least 10 successfull trips to bathroom. We ventured out to Wendy’s for dinner (we wanted to leave the house, but didn’t want to do anything outside in a 100+ degree heat index – including grilling our dinner as planned!). Chloe was doing well, but she was distracted by all the people in the restaurant and taking forever to eat. As she was eating the last bite of her dinner, she started peeing all over her chair. Awesome timing. I ran her to the bathroom and got her changed, without any toilet paper or paper towels to help. If I hadn’t just been ready to go home, the restaurant staff would have gotten a piece of my mind. Now the real challenge starts. Five of the six misses we had over the last two days were in the evening. I don’t know if Chloe lost interest by that point in the day, if we as parents became less observant or a combination of both, but we’ll obviously need to figure that out. I’m hoping it’s not a sign of what’s to come this week, because we go back to our real lives tomorow. 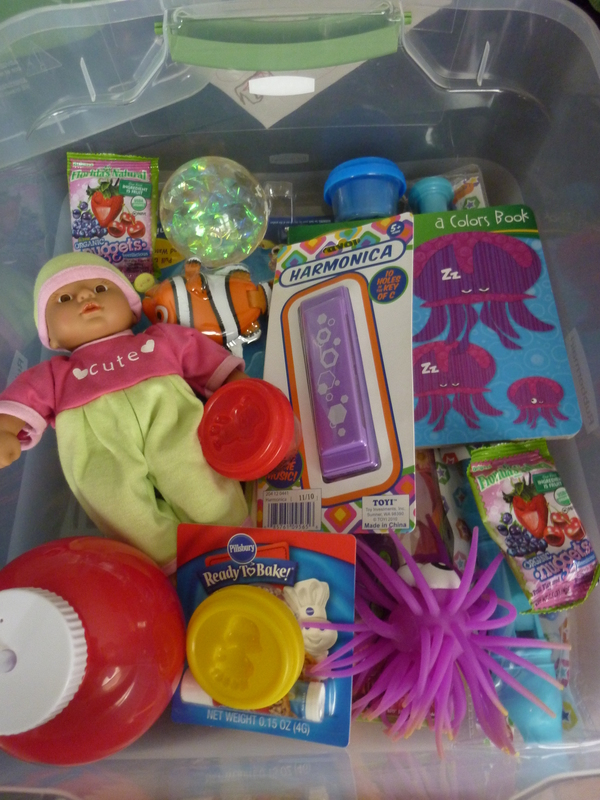 Chloe goes to MissK’s and we have Tumblebugs (a toddler gymnastics-like class) in the evening. I’d love it if we could make it through the day with no more than, or even fewer, accidents than we’ve had the last two days. Realistically, tomorrow is a whole new battle, so I have no idea what to expect. We gave potty training a go last Sunday. It was silly to try with only 1 day at home and Monday morning drop off’s with MissK are always extra crazy, so there wasn’t enough communication there. We took a bit of a breather and we haven’t been going at it with gusto this week, just reminding Chloe to go at specific times – like when she wakes up in the morning, after meals, before/after nap and before bed – but keeping a diaper on and not pushing the issue. We’ve read books about going potty, talked about it and demonstrated. It’s really quite easy for a pregnant mama to show her little girl how it’s done, and quite often!! When she’s asked for a ‘big girl treat’ or ‘n-n-n’ (aka M&M) after a success, we’ve tried to offer alternate rewards if possible. And I’ve done what I should have done from the beginning – I’ve spent evenings reading up on different strategies on the internet and checked out some books from the library. This weekend is take 2. We’re not using any 1 specific method, although I am using many ideas from Fellom’s method. When we wake up tomorrow, we’ll explain that we need to get rid of her diapers and she’s going to have to use the potty all the time. Then she’ll spend the day naked from the waist down. We won’t constantly remind her use the potty, just attempt to catch her in the act, so she learns to listen to her body’s signals. When there are accidents, we’ll just talk about what we should have done instead, i.e. told one of us or run to the potty herself. We’ll continue to talk about the potty a lot and I’ll continue to demonstrate. A sticker chart will be used and can be ‘redeemed’ for prizes after it’s filled up. Sunday will be much of the same, but with underwear on. Because, realistically, she’ll need to be covered up on a daily basis. We’ll try leaving the house, because again, realistically, we’ll need to leave the house on a daily basis. Nothing major, but a short walk or a quick trip to the park. (But honestly, the weather forecast makes that seem less than exciting!!) And speaking of leaving the house, Monday Chloe’ll head to MissK’s. Hopefully after a couple days at home, we’re having enough success that she can still do well even with the distractions of not being at home. I know it’ll be a frustrating and exhausting weekend. But I’m hoping we can stick to our guns, because I know that consistency is the best thing for all of us. I’m prepared to give it my all for the next week. If we’re still not having success after that, we’ll take a break until after Devon arrives and we’ve all adjusted to the changes that will bring. Hopefully, Chloe Mae’s a rockstar and we won’t need to worry about that though!! Are you a parent? We need your help! Chloe Mae has been working on her potty skills for months now. We want to give it the final push and get her out of diapers now though. We’d really like to get this done before Devon arrives, but I feel like that means we need to do it now so she has time to get used to it before he arrives. (Otherwise I’d say potty training is at least 4-5 months down the road.) We made an attempt yesterday, but I’m not sure we have the right strategy. She’d gotten a little wary (or possibly even scared) of pooping on the toilet, so I decided to bribe her to do it – 2 M&M’s for pooping and 1 for peeing. For a girl who’d never had M&M’s before, her love developed quickly, but then she’d only go enough to get her treat, then get up and go back to it in 5 minutes – or at MissK’s this morning she peed all over the floor 5 minutes later. Now, I’m not expecting a miracle with no accidents in a matter of days, but I’m feeling like bribery isn’t going to be the best route for us. I want to have consistency for her, so we need to decide on a strategy ASAP. And I need something that will work both at home and at MissK’s. So, what are your expert potty training tips? ?